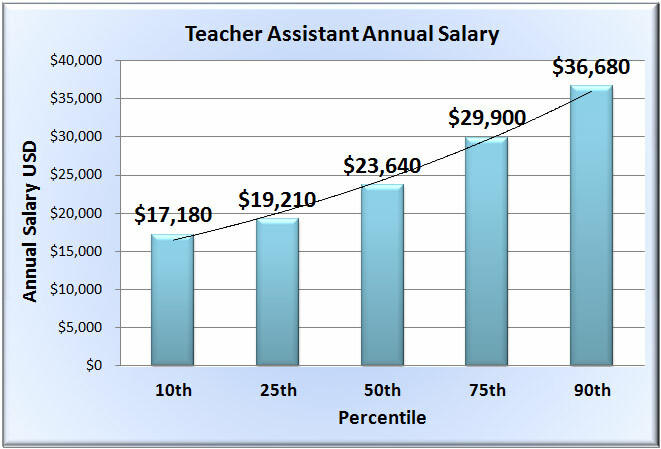 A teacher assistant earns an average annual income of $25,310. The hourly rate ranges from $7.97 to $14.86 per hour. The top 10 percent of earners make around $36,680, and the bottom 10 percent make around $17,180, per year. Many teacher assistants earn top salaries in positions at colleges, universities and professional schools. States with the highest average annual salaries for teacher assistants include Alaska ($33,510), Nevada ($32,300), Delaware ($30,590), Maine ($30,160) and Washington ($30,120). Teacher assistants may earn an annual bonus of up to $298.57 each year. About 1,185,700 teacher assistants had jobs in 2012. The bulk of teacher assistants work in elementary and secondary schools. Other common places of employment include child care services, colleges, universities, and individual/family services. From 2012 to 2022, the employment rate of teacher assistants is expected to grow by 9 percent, which is a similar job outlook for all other occupations in the United States. Job opportunities are said to be better in the South and West of the country due to increased enrollment, as well as urban schools.